Field bindweed (Convolvulus arvensis) is a tough perennial weed that causes problems for agriculture producers of all sizes, acreage owners, and homeowners alike. Bindweed can develop into a mass of roots reaching 20 feet in depth and a tangle of vegetation that can cover up to 30 or more square feet of ground. It is capable of growing over anything that is in its path. Multiple stems arise from the crown of the plant, often twining around each other forming a mass of stems that look like a green rope with leaves. The leaves are approximately 2 inches long and are shaped like a blunt arrowhead with smooth edges. It thrives in sunny, hot locations where it will stay green and continue to grow well after other plants have gone dormant from the stress. This aggressive growth is one of the primary reasons bindweed is troublesome and hard to control. Field bindweed can reproduce by both seed and root buds. The plant has a long bloom period, stretching from spring through late fall. It produces white to pink shallow, funnel-shaped flowers that open with the sun and close at night and on cloudy days. One plant can produce up to 500 seeds with a 60% viability rate. These seeds can lay dormant in the soil seed bank for 20 or more years. Seeds germinate in the spring and fall. Long-term diligence is required to keep this weed under control. Vegetative reproduction occurs when root buds develop into a new plant. The root system of field bindweed is as aggressive as the stem and leaves are. A strong taproot begins to form late in the first year of growth. The primary taproot has several lateral branch roots that contain the root buds capable of developing into a new plant. The taproot can grow to 20 feet deep and several feet horizontally. This extensive root system makes bindweed a strong competitor for water and nutrients, even in the driest of times. Control, no matter what method is used (cultural, mechanical, or chemical), is not a one-time activity. Persistent, repetitive attempts are needed to keep this weed at bay. The best way to fight field bindweed is to never let it take hold. Field bindweed is a sun-loving plant, so by keeping taller vegetation in place, you create shade that dissuades field bindweed from establishing, or at least from thriving. Also, by promoting a healthy, thick cover crop of some type you are increasing competition and reducing the opportunity for bindweed to establish itself. Chemical control can be achieved through repeated applications of selective or non-selective herbicides such as 2,4-D and glyphosate. Read the product label to determine if the herbicide you chose is labeled for your application. The extensive root system makes it difficult for the herbicide to translocate throughout the whole root system, resulting in root buds surviving and becoming new plants. For best results, time your spray application to the bloom period - the herbicide will move deeper into the roots. The fall bloom and a repeat application are the most effective as the plant is beginning to translocate carbohydrates deep into the roots for overwintering and the herbicide is moved deep into the roots as well. Mechanical control is most effective on newly germinated plants. Established plants will regenerate 3 weeks after cultivation. Continued, repetitive cultivation every 3 weeks will slow plant development as the root reserves are depleted. This aggressive cultivation schedule over 2 years will reduce the energy stores of the plant to the point it will no longer survive or be able to compete. This method may not be practical for everyone. Mowing and grazing are not viable control methods. The horizontal growth tendencies of this plant results in much of the stem and foliage of the plant being left unharmed when mowed. This allows the plant to regenerate rapidly. Field bindweed is not the preferred forage crop for most livestock, although they will eat it. In pasture situations where overgrazing is allowed, field bindweed populations can actually explode due to the reduction in competition between the plant and the forage crop. In a pasture situation, encouraging healthy vigorous growth of the cover crop coupled with proper grazing is the best defense against field bindweed. Overall, the best strategy to use against field bindweed is the early recognition of the problem and persistence. No matter which method of control you choose to adopt, it is important to realize that control is not a one application or one-pass task. Successful control includes monitoring the progress of the plant and repeated, timely implementation of the control method. 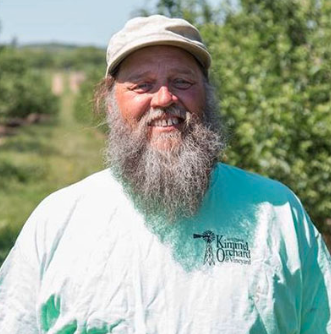 Hammond, a specialist in growing small fruits and market vegetables, is based at the Kimmel Orchard & Vineyard at Nebraska City.